Lyle: Grab your guitar and jam along! Join in on these jam sessions, which are designed to teach you theory and technique, rhythm riffs, chords, scales, riffs, and solos, as you play along to the jam tracks. Lyle: Make sure you're not muting strings you shouldn't be. 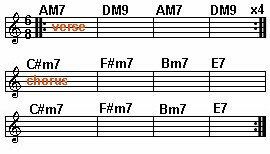 Lyle: When you listen back to the TAB file, notice how all the notes of the scale sound pretty good against the jam track. Lyle: I forgot to mention this jam is in a 6/8 time signature, meaning count to 6 for each measure. Lyle: Notice the little slide up into the note type of thing, remember I talked about that in earlier lessons on the Smooth Jazz Style, the secret sliding riff thing. Lyle: The rhythm/phrasing of the notes is very loose to help create a floating sound. I was so tempted to change this but I realized that I probably should leave it the way it is. It has more feeling this way, just a little off beat. jax: Yes I love the octaves, oh yea..! Lyle: Repeat riff 4 to equal 16 measures, then do the chorus riffs again. Lyle: Riff 4 combines both the secret sliding riff thing and the octaves using a clean guitar sound, neck pickup. Lyle: That's all I have for you on this jam. Lyle: Welcome everyone, have a great week and hope to jam with you again next Monday night!